Hi, my name is Dave Hance. I have been a kegerator owner and user for several years. I like the appliance so much I created a basement bar around it – so my wife Michele and I are home bar owners also. I hope that the information that is presented here is of use to you as you discover the joys and hassles of your own draft beer system. 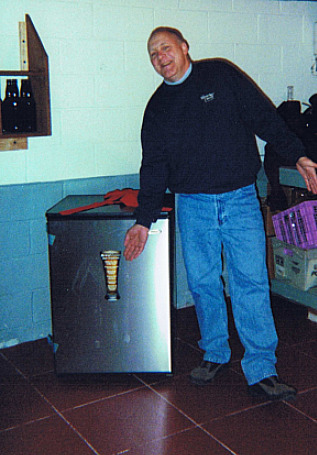 This all started at Christmas of 2005 when Michele got me a kegerator. I had asked for it and when it arrived I thought it was the best gift I'd ever received - still do! Having had the experience over and over of bad tasting draft beer in local bars, draft at home was an exciting option. However, along the way I learned that the machine was a bit imperfect and that began the odyssey that has led to the creation of this site. Shortly after the kegerator arrived along came an opportunity to take over a business cleaning draft beer lines for local bars! That's serendipity. However, my view of draft beer changed considerably. I went from being a pure hobbyist to a professional draft service professional. Being someone that is not afraid to take on projects and activities with little or no experience, I delved into learning all about draft beer, draft beer systems and the equipment and technology involved. I also attended this draft beer school. It wasn't long before I started to get inquiries from home bar owners about how to solve problems with their kegerators. This inspired me to delve more fully into solving these common problems. The same ones I was having myself at home. 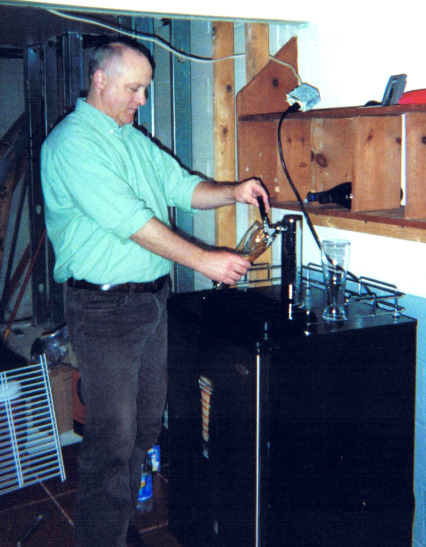 After some research on the Internet, I of course, found a group of other home bar owners with kegerator woes and learned of the solutions some of them used. These folks encouraged me to experiment at home to come up with solutions. This allowed me to help a number of home bar owners with their draft beer issues. Of course the Internet is filled with information about draft beer systems, trouble shooting problems and sites where equipment is sold. However, since much of the information is incomplete and scattered throughout various sites and forums, I started thinking about collating all that information into a manual or book of some sort that would be of use to everyone who owns a kegerator. Wouldn't it be nice to have one definitive guide? Concurrent to all that, it also became clear to me that my bar and restaurant customers knew very little about the draft beer they were serving and how the systems that they own, work. So, even commercial bars needed a source of information on solving common problems. Along the way, in the midst of this time-line I had the opportunity to work as a Brewery Assistant at The Brewer's Apprentice in Freehold, NJ. The responsibilities included finalizing batches of beer by testing for complete fermentation and sampling (tasting) for bad batches. But the significant responsibility was kegging and carbonating every batch of beer made. Being in that role exposed me to home brewers that had questions about kegging their beer and dealing with serving issues. This led to more research and experimentation with kegging, carbonating and serving home brew. That research led me to create a manual specifically for home brewers called The Guide to Kegging Your Home Brew. So now with three big areas where there are issues with draft beer: home bar owners, commercial bar owners and home brewers, I give you Draft Beer Made Easy a website devoted to solving problems with serving draft beer. This site is a work in progress and content is regularly added and updated, so come back often to learn more as the need arises for you. Better yet participate in the site by contributing comments and reviews on kegerators and other equipment, signing up for the Home Bar Owner newsletter and contributing your own home bar stories. Though I don't know everything and learn simply by doing - this site is created to help you and I hope it can.